August 27, 2010 – Islamic Republic security forces prevented families of political prisoners from observing the 22nd anniversary of the mass execution of political prisoners in Iranian prisons. The families, who gathered every summer at the Khavaran Cemetery in commemoration of their kin, faced resistance from security forces this year and a number of them were arrested. Human Rights and Democracy Activists of Iran report that security forces had set up road blocks and stopped the families from visiting the resting places of their kin. According to this report a number of people were also beaten by the security forces and despite the restrictions, some of the families managed to reach the graves of their loved ones. 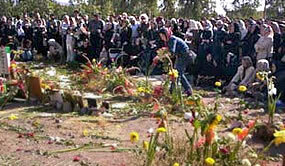 In the summer of 1988, the Islamic Republic executed scores of political prisoners serving prison terms in jails for the charge of membership in dissident groups and buried them in mass graves at the Khavaran Cemetery. While Amnesty International puts the number of executions at over 2500, Ayatollah Montazeri, the late dissident cleric mentions “2800 or perhaps 3800” indicating that he does not remember the exact number. However, many opponents of the Islamic Republic claim that the number far exceeds these quotes. After three years of silence, in 1991, the families along with other social activists began gathering at Khavaran Cemetery to remember their kin , an event which they have observed every summer since then.